A new Magic: The Gathering set, Magic 2015, was released this week, and the artwork is simply stunning. Check out this gallery of hi-res artwork from the new set—filled with Planeswalkers, weird creatures, and the souls of Magic's most popular planes brought to glorious illustrated life. 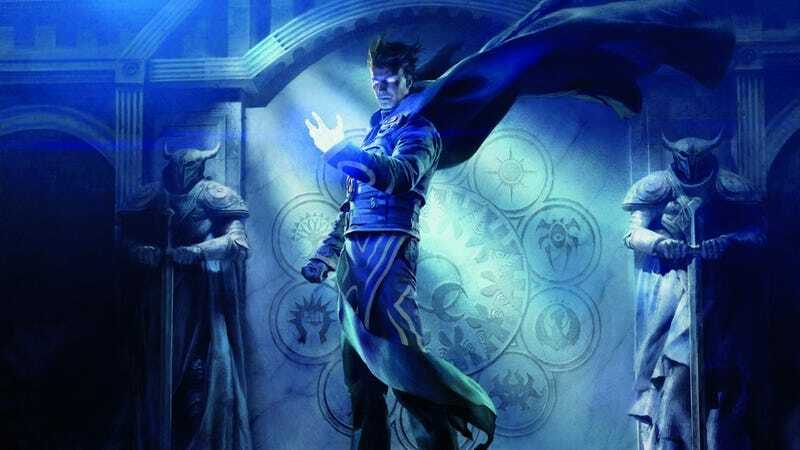 M15 features the return of five of the classic Planeswalkers, new slivers, and new "souls," powerful creatures representing five favorite planes from Magic's long history. It should be easy to find M15 online or at your local game store. Diffusion Sliver by Trevor Claxton. Leeching Sliver by Svetlin Velinov. Ajani Steadfast by Chris Rahn. Venom Sliver by Dave Kendall. Soul of New Phyrexia by Daarken. Garruk, Apex Predator by Tyler Jacobson. Nissa, Worldwaker by Peter Mohrbacher. Soul of Shandalar by Raymond Swanland. Belligerent Sliver by Raymond Swanland. Sliver Hive by Igor Kieryluk. Constricting Sliver by Karl Kopinski. Soul of Ravnica by Stephan Martiniere. Soul of Theros by Zack Stella. Sliver Hivelord by Aleksi Briclot. Soul of Innistrad by Adam Paquette. Soul of Zendikar by Vincent Prose. Liliana Vess by Aleksi Briclot.